Promoting substantive and meaningful partnerships for instrument development between the academic and private sectors. Such partnerships have the potential to build capacity for instrument development in academic settings and to create new products with wide scientific and commercial impact. Solicitation (NSF 15-504) and Frequently Asked Questions (FAQs) will continue to be in effect for the FY 2017 MRI Competition. As indicated in the solicitation, the submission deadline for MRI proposals is the second Wednesday in January (January 11, 2017). The Proposal and Award Policies and Procedures Guide PAPPG 16-1 will apply for this competition. The MRI Program especially seeks broad representation in its award portfolio, as PIs (as well as co-PIs and instrument users and developers), by women, underrepresented minorities and persons with disabilities. *The 2016 Major Research Instrumentation Committee of Visitors (MRI COV) Meeting was held from September 22 through September 23, 2016 in Arlington, Virginia. The COV report and NSF’s response are not yet available. * Projects funded under ARRA are included with this link. **One time only, awards made in response to the Gulf of 2010 Mexico oil spill. 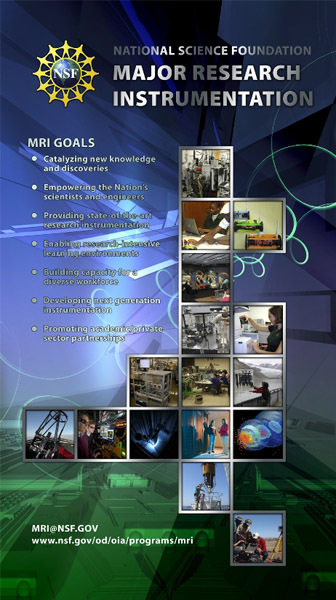 The NSF-wide MRI Webpage can be accessed here.